KINGSTON, R.I. (AP) The party was four nights ago – when Rhode Island celebrated its first outright Atlantic 10 title in school history. One game later, it was completely wiped away by a miserable performance. James Demery scored 21 points, Taylor Funk had 17 and Saint Joseph’s stunned No. 17 Rhode Island 78-48 on Tuesday night. Shavar Newkirk added 14 points for the Hawks (14-15, 9-8 A 10), who posted their first true road victory over a ranked team since beating No. 15 Georgetown on Jan. 2, 1979. Jared Terrell scored 19 points with seven rebounds and E.C. Matthews had 13 points for Rhode Island (23-5, 15-2). It was the Rams’ second loss in four games after a school record 16-game winning streak. URI shot just 28.1 percent in the game. Taking their home court again for the first time after they clinched their first outright A-10 title in school history and edged up a spot in this week’s AP poll, the Rams came out ice cold from the field, missing 25 of their 31 shots in the opening half. Saint Joseph’s led 35-16 at halftime. The Hawks came into the night ranked 313th in the nation in 3-point field goal percentage at just 32 percent, but they hit their first four and opened a 13-point lead just before the second media timeout. URI went 4 for 24 from the field in the opening 14 minutes. Saint Joseph’s closed the half by scoring nine of the final 11 points. Playing mostly zone, the Hawks seemed to keep the Rams from getting into any offensive rhythm. URI’s many missed shots didn’t help either. Saint Joseph’s scored eight of the initial 11 points in the second half, pulling to a 43-19 lead on Chris Clover’s driving basket with 16:17 to play. They pushed it to 54-21 on Demery’s fastbreak jam after the Hawks outhustled URI to a loose ball at midcourt. On Friday night, the Ryan Center was rocking and filled with blue and white – the school’s colors – confetti and streamers and they were cutting down a net, but the Rams were unable to find any success offensively in the second half, too, spoiling their bid for a perfect 16-0 record at home this season. Saint Joseph’s: For a school looking for any type of postseason tournament berth, the Hawks needed a resume-builder and a solid run at the conference tourney next week. This was the first step. 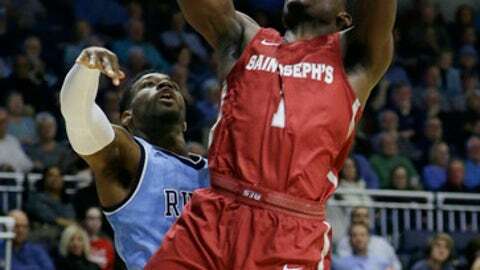 Rhode Island: The Rams were trending upward for a solid seed in their probable NCAA tourney invitation, but this loss may hurt their national recognition. Hurley said they’ll watch the film of the loss. ”We’ll watch this tomorrow and we’re going to own it as players and coaches,” he said. Hurley wiped away tears during Senior Night festivities. Three of the seniors honored – Matthews, Terrell and Jarvis Garrett – can set the school mark for most wins in a four-year span with three more victories. In 2011, Marquise Jones, Will Martell, Ben Eaves and Delroy James completed their collegiate careers with 90 victories. Two other seniors, Stanford Robinson and Andre Berry – both transfers – also played their final home game. Saint Joseph’s: Closes its regular season at home Saturday against La Salle. Rhode Island: Plays its regular season finale at Davidson on Friday.